Sorry, forgive the pun. Piano, Roxy, music…… But actually, photographing professional glamour model Roxy Mendez was music to my ears. Roxy was an absolute joy to work with. A total professional who knows how to work the camera. I’d photograph her again anytime. The photoshoot was held at a fantastic location. A huge house complete with grand drawing room and piano. I just had to use it. The lighting for this set was pretty simple. I used two Elinchrom studio flash units. 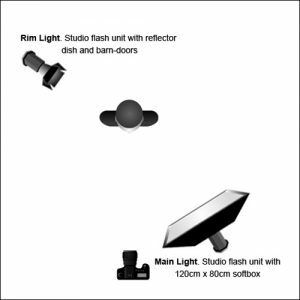 The main light from the front was fitted with a large softbox. A back light was fitted with a bare reflector dish and barn-doors and used to add some hair and rim lighting onto Roxy. My photography blog is four years old! By the way, today is my website’s fourth birthday. I published my first blog post on 19th November 2012 and have published updates every month since. I’m actually quite proud of the fact that I’ve kept the site going all this time. So many blogs launch with good intentions then fizzle out through lack of content. Running a blog takes time. You need to be quite disciplined to force yourself to sit down and update the site regularly. Over the last four years I’ve received dozens of emails from photographers from all over the world, asking for advice or commenting on certain photographs or blog posts. Every email receives an answer and I’m always happy to help where I can. In this time I’ve also photographed scores of people – professional glamour models, amateur models and first-time models, both female and male. I’m currently trying to play catchup with a backlog of images waiting to be post-processed and published. I hope to be bringing you more images for many years to come. Do please feel free to comment and tell me what you would like to see on this site. As ever, thank you for reading. Click on each image to see it bigger and please feel free to leave a comment below. Congratulations on reaching your fourth anniversary! It’s been great to see what you’ve achieved. Just came upon your site ( a link via dpreview forum) and just what I needed, and when. Still consider myself an amatuer photographer (even after 113 wedding shoots) due in part to being self taught off the internet. I have had every intention of getting into more boudoir but lacked focus. Your photography, posted photos and direction (lighting scenarios) is giving me encouragement. I have all the gear just needed encouragement (push). Will read all I can on here and practice, practice. My website now down as I have stopped Wedding photography.Perhaps I can share photos in the future for critique.Love your work. Thank you so much for taking the time to leave a comment. I’m flattered by your words and that my website has inspired you.